In stock -This product will ship today if ordered within the next 6 hours and 11 minutes. 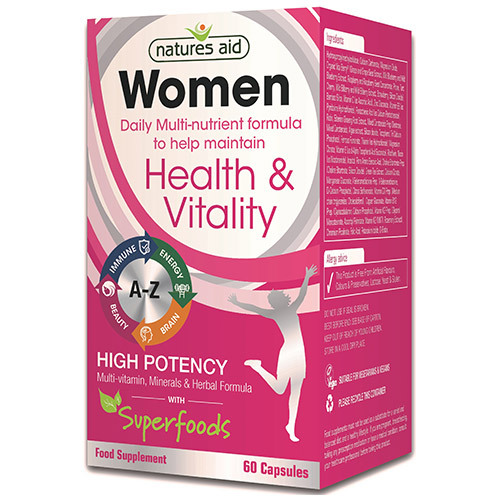 Natures Aid Women’s daily multi-vitamin and minerals contains 38 carefully selected ingredients for everyday maintenance of good health. Hydroxypropylmethylcellulose, Calcium Carbonate, Magnesium Oxide, Organic Vita Berry® (Grape and Grape Seed Extract, Wild Blueberry and Wild Blueberry Extract, Raspberry and Raspberry Seed Concentrate, Prune, Tart Cherry, Wild Bilberry and Wild Bilberry Extract, Strawberry, Silicon Dioxide), Bamboo Silica, Vitamin C (as Ascorbic Acid), Zinc Gluconate, Vitamin B6 (as Pyridoxine Hydrochloride), Pantothenic Acid (as Calcium Pantothenate), Rutin, Siberian Ginseng Root Extract, Mixed Carotenoids Prep (Dextrose, Mixed Carotenoids, Algae extract, Silicon dioxide, Tocopherol, Tri Calcium Phosphate), Ferrous Fumarate, Thiamin (as Hydrochloride), Magnesium Citrate, Vitamin E (as d-Alpha Tocopherol Acid Succinate), Riboflavin, Niacin (as Nicotinamide), Inositol, Para Amino Benzoic Acid, Choline Bitartrate Prep. (Choline Bitartrate, Silicon Dioxide), Green Tea Extract, Calcium Citrate, Manganese Gluconate, l-Selenomethionine Prep. (l-Selenomethionine, Di-Calcium Phosphate), Citrus Bioflavonoids, Vitamin D3 Prep. (Medium chain triglycerides, Cholecalciferol), Copper Gluconate, Vitamin B12 Prep. (Cyanocobalamin, Calcium Phosphate), Vitamin K2 Prep. (Glycerol Monostearate, Ascorbyl Palmitate, Vitamin K2 (MK7), Rosemary Extract), Chromium Picolinate, Folic Acid, Potassium Iodide, D-Biotin. 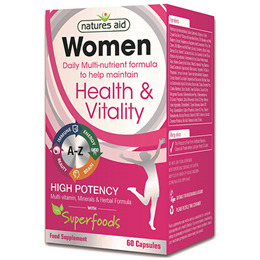 Below are reviews of Natures Aid Women`s Multivitamins & Minerals - 60 Capsules by bodykind customers. If you have tried this product we'd love to hear what you think so please leave a review.